I did a lot of hunting on the Internet to find out if the Roland V Drum PDX-8 would work with the electronic drum module that comes with the WHD 516-Pro (DD516) kit. There was no information that I could find but gear4music very kindly tried it out for me and confirmed. Everyone I have spoken to there has been very enthusiastic and helpful. For anyone else who wants to mix and match drums I can also confirm that the Roland PDX-8 drum does work with the DD516 module. Including the rim shot. I did have to adjust the Threshold setting to avoid getting the rim sound instead of the drum sound but that was easy. I initially set the Threshold for the snare up to 15 which completely eliminates accidental rim shot sounds. Unfortunately this also made it difficult to do fast drum rolls. I found 13 was the optimal setting. For the avoidance of doubt, this is not the sensitivity setting which just determines how loud the noise is based on the velocity it is struck at. 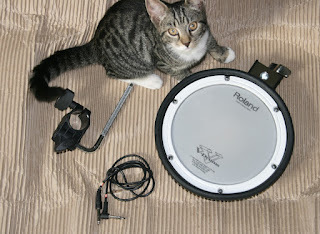 The Roland drum uses a slightly larger metal post to mount on to. The ones with the DD516 are too small. I bought a Roland bracket to suit from eBay. Not just the metal bit but the plastic clamp as well because the size of the other end that fixes to the clamp is also different. Fortunately the racks are standard 1.5 inch diameter so the clamp fits the rack. Looking at other e-bay sites there are two sizes of drum mounting post. The Gibraltar racks have a choice of just over 10mm and just over 12mm sizes. I found it difficult to measure what I had because those sizes must refer to the diameter of the knurled section which is a bit larger than the metal rod. 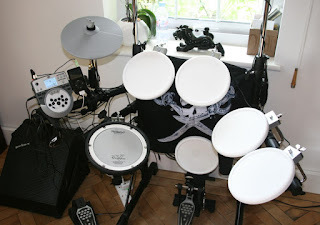 The Roland drums fit the 12mm size and the DD516 drums use the 10mm size. This drum has an overall size of just over 10" with a mesh head about 8" diameter. Shelley says the mesh head is just like playing an acoustic drum. She is very impressed. The budget DD516-Pro (or WHD 516-Pro) is very good value and the module is all that she needs but the more expensive Roland drum has a better feel and response when playing. Sorry I have not done any setup with EZDrummer so I don't know. Hello. Is your ride cymbal dual zone or single zone? Cause mine from DD512 is single zone. I've just double checked. The ride is dual zone on the DD516. Dual Zone: Crash1, Ride, Snare, Tom1, Tom2, Tom3 and Tom4. Single Zone: Hi-Hat, Kick and Crash2. The DD516 has some adjustment which can affect how sensitive the zones are. So, presumably, I can turn tom into dual zone cymbal, and cymbal into single zone tom on my DD512, because I don't really need dual zone toms. I want to buy Roland CY-8 and connect it to a tom channel so it will become a dual zone cymbal. I have an issue with this. I tried DD506's dual zone cymbal, but only one zone worked on it. I think it's because the balanced\unbalanced cables issue has its place there. What can you say about it? I can't comment on what the DD512 or the DD506 can do because I have never used either of them. I have also never tried a CY-8 cymbal connected to the DD516 so I cannot be confident about that either. On the DD516 I can confirm that I have plugged a Roland Tom in to the Crash2 socket and I get a single zone Tom and in to Tom4 and get a dual zone Tom. It was necessary to fiddle with the dual zone adjustment on the DD516 for the Roland Tom to work correctly.